For other people named Andrew Johnston, see Andrew Johnston (disambiguation). Johnston was born on 23 September 1994 in Dumfries, Scotland, the son of Andrew Johnston and Morag Brannock. He was given the extensive name Andrew Aaron Lewis Patrick Brannock John Grieve Michael Robert Oscar Schmidt Johnston. Johnston's parents separated when he was eight months old, and from that time he lived with his mother and three older siblings in Carlisle, Cumbria, in the north of England, where he attended Trinity School. Johnston tried out for Carlisle Cathedral Choir at the age of six at the recommendation of Kim Harris, a teacher at his primary school. He was auditioned by the choirmaster Jeremy Suter and accepted into the choir at the age of seven. Johnston's mother, who had no previous association with the cathedral, described her feelings of being overwhelmed by emotion at having her boy singing in such a "stunning building among those extraordinary voices". His mother also described Johnston's busy regimen of practice four times a week and all day Sundays, saying that it took up all of their spare time. However, she said that the cathedral staff became like a family to her son, and that "it was such a lovely, safe, close feeling for him". Johnston, who attended Trinity School, was subject to abuse and threats from bullies which drove him to contemplate quitting the choir, but he was helped through the ordeal by his choirmaster and the dean and canons of the cathedral. By the time of his participation in Britain's Got Talent, Johnston was head chorister. In September 2008, after his appearance on Britain's Got Talent but before the release of his first album, Johnston embarked on a tour of Norway with the choir, performing at Stavanger Cathedral and Utstein Abbey, among other places. The tour was conceived because the Diocese of Stavanger is connected with the Diocese of Carlisle through the Partnership for World Mission. This was Johnston's last tour with the choir. Johnston features as head chorister on one of the choir's albums, The Choral Music of F.W Wadely, released in November 2008. Johnston was entered as a competitor in the second series of Britain's Got Talent by his mother. He passed the first public audition, singing "Pie Jesu" from Andrew Lloyd Webber's Requiem. Amanda Holden, one of the competition's judges, was brought to tears, and the audience offered Johnston a standing ovation. Johnston was tipped as the favourite to win the competition. Later, Johnston described his initial audition as daunting, saying that "it was scary singing in front of 2,500 people. I had never sang on stage before – then there was also Simon, Amanda and Piers". He won his semi-final heat on 27 May 2008, receiving the most public votes on the night and thereby qualifying for the final. He sang "Tears in Heaven" by Eric Clapton; judge Holden told him he had "a gift from God in [his] voice". At the final on 30 May, he again sang "Pie Jesu". He finished in third place, behind the winner, the street dancer George Sampson and runners-up, the dance group Signature. Johnston left the stage in tears, later saying that he "was upset. But when you see the talent that was there, it was an honour just to be in the final". The day after the final, Cowell's publicist Max Clifford said that it was "quite possible" that Cowell would be offering record contracts to some of the finalists, including Johnston. Johnston and other contestants then embarked on a national arena tour. During his initial audition, Johnston claimed that he was bullied and victimised from the age of six because of his singing. When asked how he dealt with the issue, he stated "I carry on singing." 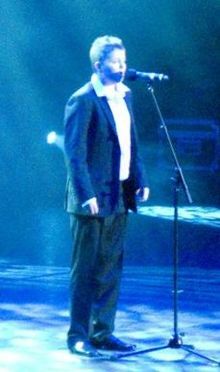 There were claims in the Daily Mail, a UK-based tabloid newspaper, that the programme's producers had deliberately overstated the extent of Johnston's bullying as a "sob story", suggesting that sympathy rather than his singing got him many of the votes. However, in The Times, Johnston's success story was described as "the stuff of fairytales", as he was successful despite having been raised in "poverty". Johnston said he did not talk about being bullied because he was told to do so by producers, but "because I believed it would help people who were going through what I had gone through be stronger". Johnston has subsequently visited schools and elsewhere to help other victims of bullying. He said "I want to use my experience of bullies to help other kids". On 12 June 2008, while Johnston was travelling with the Britain's Got Talent Live Tour, it was announced that Johnston had signed a record deal with Syco Music, a division of Sony BMG, and that his first album would be produced after the tour. The deal was reportedly for £1 million. After signing with Syco, Johnston made public appearances, including performing at Andrew Lloyd Webber's birthday celebrations on 14 September, and at Carlisle United's Brunton Park. Johnston's debut album, One Voice, was released on 29 September 2008. It includes a cover of "Walking in the Air", performed with Faryl Smith. The album was recorded over a six-week period in London, and the track listing was chosen by Cowell. Johnston described the recording process as "brilliant", and that it was "really good – just to be in a recording studio and meet the different people". The album debuted in the British charts at number five, and finished the week at number four. The album was later certified gold, having sold 100,000 copies, and Johnston was presented a gold disc by daytime television presenter Penny Smith. Critics responded positively to the album, with Kate Leaver, writing for the Korea JoongAng Daily, saying Johnston "has truer talent than hordes of his musical elders" and that "the vulnerability" of Johnston's performance on the album "makes for a haunting musical experience". In Music Week, the album was described as "highly-anticipated", and Johnston was called "exceptionally-talented". After the album's release, Johnston became involved in the Sing Up campaign, appearing in schools around the country to encourage other young people to join choirs. In December 2008, Johnston made a guest appearance at Whitehaven's Christmas fair, and performed at a carol service in Bradford. Johnston was also invited to turn on the Carlisle Christmas lights and perform at the celebrations. Mike Mitchelson, of Carlisle City Council, described Johnston as "one of our local heroes". In September 2009, Johnston announced that he would be taking a year off from singing as his voice had broken, changing him to a tenor. He had previously performed as a treble. He said "the tutors at [the Royal Northern College of Music] said they'll be able to train my voice up again. It's the same as it ever was, just deeper". Johnston's voice then changed from a tenor to a baritone. After remaining out of the spotlight for two years, he joined the National Youth Choir, saying "I'm just another lad in there – no one focuses on Britain's Got Talent and I'm happy about that". In 2011, he was awarded a Royal School of Church Music Gold medal; public performances that year included a charitable concert, alongside organists John Bromley and Tony Green, at St Paul's Church, Helsby in November. In September 2013, Johnston began to study for a Bachelor of Music degree at the Royal Northern College of Music, under the tutelage of Jeff Lawton, who had previously tutored him at the Junior College. He immediately joined the college's Chamber Choir and the Manchester Cathedral choir, but said that he intended to still sing with the Carlisle Cathedral choir where possible. While a student, Johnston's singing was adversely affected by a broken nose, the result of an unprovoked attack in a Carlisle nightclub on New Year's Day, 2014. Johnston's family home is in Stanwix, Carlisle. His mother, Morag Brannock, worked for the Office for National Statistics before giving up her job to support her son's career. Prior to his Britain's Got Talent appearances, he attended Trinity School, and later received tuition from a personal tutor. Johnston said that he "had a lot of support from local people when ... taking part in Britain's Got Talent", and was given a civic award for outstanding achievement by Carlisle City Council in March 2009. Johnston's interests include jujitsu, in which he has a black belt. The Carlisle newspaper News and Star reported in September 2012 that Johnston had become the youngest person in the world to be granted a licence to teach the sport. ^ "George Sampson and Andrew Johnston". OK!. 23 September 2008. Archived from the original on 1 October 2008. Retrieved 30 September 2008. ^ Barry, Maggie (15 April 2008). "Britain's Got Talent choirboy Andrew Johnston's dad: I'm so proud". The Daily Mirror. Retrieved 18 September 2010. ^ a b "Choirboy Andrew Johnston reunited with primary school teacher". Daily Mirror. 19 April 2008. Retrieved 10 June 2009. ^ a b c "Simon Cowell prodigy Andrew Johnston set to storm the charts". The Cumberland News. 26 September 2008. Archived from the original on 9 August 2011. Retrieved 26 September 2008. ^ a b McGowan, Pamela (26 August 2008). "Andrew to sing in city ahead of tour with choir". The Cumberland News. Archived from the original on 11 October 2008. Retrieved 18 September 2008. ^ "Cathedral Choir's CD". The Cumberland News. 21 November 2008. Archived from the original on 9 March 2012. Retrieved 21 November 2008. ^ "'Bullied' boy wows Talent judge". itv.com. 14 April 2008. Archived from the original on 21 May 2008. Retrieved 12 June 2008. ^ Hardie, Beth (28 May 2008). "Britain's Got Talent: Cheeky Monkeys and Andrew Johnston make final". Daily Mirror. Retrieved 12 June 2008. ^ Hastings, Chris (15 June 2008). "20 million tune in for talent show finals". The Daily Telegraph. Retrieved 18 September 2008. ^ a b c d Singh, Anita (12 June 2015). "Britain's Got Talent choirboy Andrew Johnston signs £1m record deal". The Daily Telegraph. Retrieved 16 December 2015. ^ a b c McIver, Brian (18 December 2008). "It's been an amazing year for me, says Britain's Got Talent star Andrew Johnston". Daily Record. Archived from the original on 19 January 2009. Retrieved 18 December 2008. ^ Martin, Nicole; Singh, Anita (2 June 2008). "Simon Cowell to sign up Britain's Got Talent losers". The Daily Telegraph. Archived from the original on 13 June 2008. Retrieved 12 June 2008. ^ Revoir, Paul (28 May 2008). "Bullied 13-year-old with voice of an angel is tipped to win Britain's Got Talent". Daily Mail. Archived from the original on 30 May 2008. Retrieved 12 June 2008. ^ Revoir, Paul (18 April 2008). "Is the Britain's Got Talent choirboy REALLY a bullied kid from a sink estate? His mother admits: 'The pudding may have been over-egged'". Daily Mail. Retrieved 12 June 2008. ^ Platell, Amanda (28 August 2008). "Want fame? Forget hard work. Just try hard luck on X Factor". Daily Mail. Archived from the original on 13 September 2008. Retrieved 18 September 2008. ^ Woong-ki, Song (12 February 2009). "'Singing is almost everything to me' Andrew Johnston". The Korea Herald. Archived from the original on 4 October 2012. Retrieved 11 February 2009. ^ Coates, Brian (9 December 2008). "Ignore the bullies, follow your dream". Halifax Courier. Archived from the original on 12 December 2008. Retrieved 14 December 2008. ^ "Talent show choirboy lands record deal". The Herald. 12 June 2008. Archived from the original on 5 May 2013. Retrieved 26 October 2009. ^ Story, Chris (12 September 2008). "Carlisle choirboy to sing at Lloyd Webber's birthday". The Cumberland News. Archived from the original on 15 September 2008. Retrieved 18 September 2008. ^ Story, Chris (29 September 2008). "Andrew Johnston's sweet dream to sing with Annie Lennox". The Cumberland News. Archived from the original on 4 October 2008. Retrieved 29 September 2008. ^ Johnston, Jenny (27 September 2008). "Where are they now? Faryl Smith". Daily Mail. Archived from the original on 27 September 2008. Retrieved 28 September 2008. ^ Armstrong, Julie (8 September 2008). "Choirboy Andrew Johnston's album out next week". News and Star. Archived from the original on 2 December 2008. Retrieved 24 September 2008. ^ a b c d Green, Mark (15 December 2008). "A week in the life of Andrew Johnston". News and Star. Archived from the original on 7 March 2012. Retrieved 16 December 2008. ^ Clarke, Stuart (30 September 2008). "Pink is back on top". Music Week. Archived from the original on 5 October 2008. Retrieved 30 September 2008. ^ Castle, Tim (5 October 2008). "Pink's "So What" tops pop charts". Reuters UK. Archived from the original on 8 October 2008. Retrieved 5 October 2008. ^ Gudgeon, Dave (20 December 2008). "Andrew Johnston is Carlisle's golden boy". News and Star. Archived from the original on 24 December 2008. Retrieved 21 December 2008. ^ Garcia, Cathy Rose A. (16 February 2009). "Andrew Johnston's Angelic Voice Soars". The Korea Times. Retrieved 17 February 2009. ^ Leaver, Kate (16 February 2009). "New Releases: Andrew Johnston". Korea JoongAng Daily. Retrieved 15 February 2009. ^ "Q4 2008: Sony BMG: Hits in all areas". Music Week. 20 September 2008. p. 12. ^ Legg, Matthew (8 December 2008). "Andrew Johnston meets and greets his Whitehaven fans". The Whitehaven News. Archived from the original on 11 December 2008. Retrieved 8 December 2008. ^ Griffiths, Kathie (15 December 2008). "TV star joins Cathedral carols". Telegraph & Argus. Archived from the original on 11 January 2009. Retrieved 16 December 2008. ^ a b c McClounie, Pam (30 October 2008). "Andrew to switch on Xmas lights". The Cumberland News. Archived from the original on 9 March 2012. Retrieved 31 October 2008. ^ a b c Jorsh, Meg (28 August 2009). "Carlisle BGT star Andrew Johnston 'loses voice' for year". News and Star. Archived from the original on 7 March 2012. Retrieved 3 September 2009. ^ Brown, Ismene (21 May 2008). "Britain's Got Talent: budding talent, treat with care". The Daily Telegraph. Retrieved 13 October 2010. ^ Wootton, Dan (23 March 2012). "Britain's talent grows up: As BGT returns, how the young runners-up became winners". Daily Mail. Retrieved 20 August 2013. ^ a b Coleman, Phil (14 October 2011). "Andrew Johnston: From Britain's Got Talent choirboy to jujitsu black belt". The Cumberland News. Archived from the original on 20 May 2012. Retrieved 20 August 2013. ^ Bamber, Katie (10 November 2011). "Britain's Got Talent teenager to sing at Helsby church concert". Chester Chronicle. Archived from the original on 22 December 2015. Retrieved 14 December 2015. ^ "Latest News – April 2013". Official website. 2013. Archived from the original on 22 June 2012. Retrieved 21 May 2013. Andrew has received formal notification that he has a place on the BMus (Hons) Performance/Composition undergraduate course at the Royal Northern College of Music and that he will be taking up his place in September. ^ Johnston, Andrew (September 2013). "Personal message". Archived from the original on 13 October 2013. Retrieved 12 November 2013. ^ "Brutal nightclub attack on Britain's Got Talent star". News and Star. 30 April 2014. Archived from the original on 22 December 2015. Retrieved 16 December 2015. ^ Whittle, Julian (14 March 2009). "Carlisle's unsung heroes – and a singing sensation". News and Star. Archived from the original on 7 March 2012. Retrieved 14 March 2009. ^ McGowan, Pamela (18 September 2012). "Carlisle's Britain's Got Talent star is youngest in world to get jujitsu licence". News and Star. Archived from the original on 6 October 2013. Retrieved 20 August 2013. ^ "Andrew Johnston CD One Voice is number four in UK top 40 album chart". The Cumberland News/News and Star. 5 October 2008. Archived from the original on 24 February 2012. ^ "Irish Charts Week 41 – 2008 Top 50 Albums". Irish Recorded Music Association. Retrieved 29 October 2009. ^ "Certified Awards Search". British Phonographic Industry. Archived from the original on 17 January 2010. Retrieved 1 December 2009. Wikimedia Commons has media related to Andrew Johnston. This page was last edited on 3 February 2019, at 03:02 (UTC).